the required controls, the combination of sailing performance and comfort, the builders’ attention to detail, and the value. Today, Leopard 44s are sprinkled around the world, crossing oceans and hosting family daysails alike. I interviewed David Arnold of Cumberland, RI, the owner of Call Me Crazy, to hear what he has to say about his Leopard 44 that serves as a platform for family fun. How did you choose the Leopard 44? We had looked at a lot of different boats. We were looking originally at monohulls. We had been living in Scotland, but we were back in the U.S. in Delray Beach, FL. We saw an open house for a new Leopard shop and we walked in, walked on the 44, and it was like when you look at a house and you know it’s going to be your home. After you took ownership, you delivered her to North Carolina and then Rhode Island. Had you done any long distance cruising previously? No. We did it with a crew, and it was a great trip. We saw dolphins, whales, big sunfish and sea turtles, and ran into a shark that was sleeping on the surface. The fishing was great, and we filled the freezer with mahi mahi. How did you feel about the boat during that first offshore trip? It was great. It’s such a stable platform. We had no issues. We sailed half the time and motor-sailed half the time. It’s much quicker sailing than motoring, which is nice. We had about every different type of weather you could imagine. Beautiful blue sky days, then fogged in and squally off Block Island. She handled really well. It was a good trip all in all. Did your kids know how to sail before you owned the boat? Have they learned now? below our keels. We have it all to ourselves. One of the commercial guys will come in for clams and that will be our only neighbor. The kids love it. They each have their jobs, which is helpful and keeps them involved. 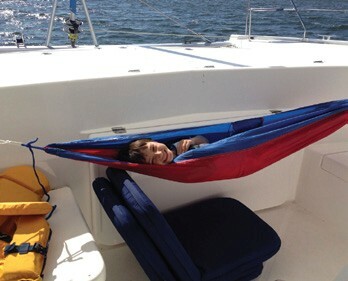 We have plenty of overnights with their friends on the boat. There’s plenty of space for everybody. We carry toys on the boat, including a couple of kayaks and a tender. We’re a very popular family! The older two get involved with sailing. They haven’t done junior sailing yet, but will this summer. The 44 is so easy to sail. With everything being led to the helm station – the electric winches and everything – it’s just so easy. Is your wife a big sailor? How does she like the boat? She’s more about the destination than the journey, but she really enjoys it as well. 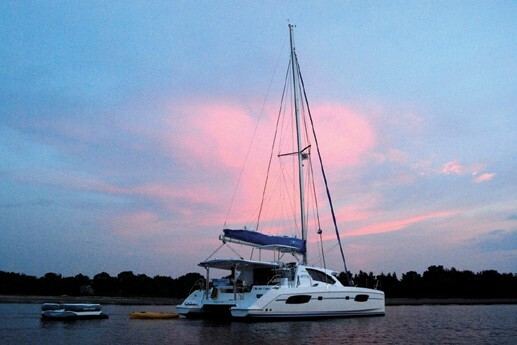 We’re so much happier having made the decision to buy a catamaran than a monohull, from a safety and stability standpoint, and we get so much more space on this platform than we would have on a monohull without going ridiculously sized. Do you have any feedback on performance, handling, or ease of care? The maintenance has been fine. There were a few post-delivery things that needed to be addressed after the shakedown cruise, and Jim and Derek and the team in Florida were good at getting us through that. She sails really well and she’s very very fast, I don’t push her really hard with the kids on it, but we easily go half the windspeed or more up to about 20 knots. She points really high, we can sail her at 35 off the wind. I don’t race her formally, but we race every boat that’s out there! Daniela Clark is the Online Marketing Specialist at TUI Marine in Clearwater, FL, representing The Moorings, Sunsail, Le Boat, and Leopard Catamarans. 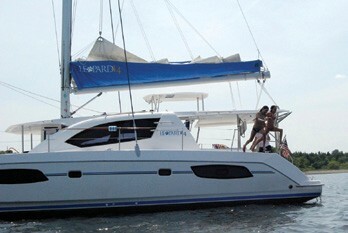 For more information on the Leopard 44, as well as the Leopard 39, 48 and 58 and the Leopard 39 PC and 51 PC Powercats, visit leopardcatamarans.com.